​Just the name “Chanel” is enough to make me go crazy and to be honest, I don't even need to watch their shows, I already know whatever comes from that cooking pot of Karl Lagerfeld's head, will most probably be breath-taking, however, I do watch the shows, just for a little reassurance, you know! And once again, I was not disappointed. 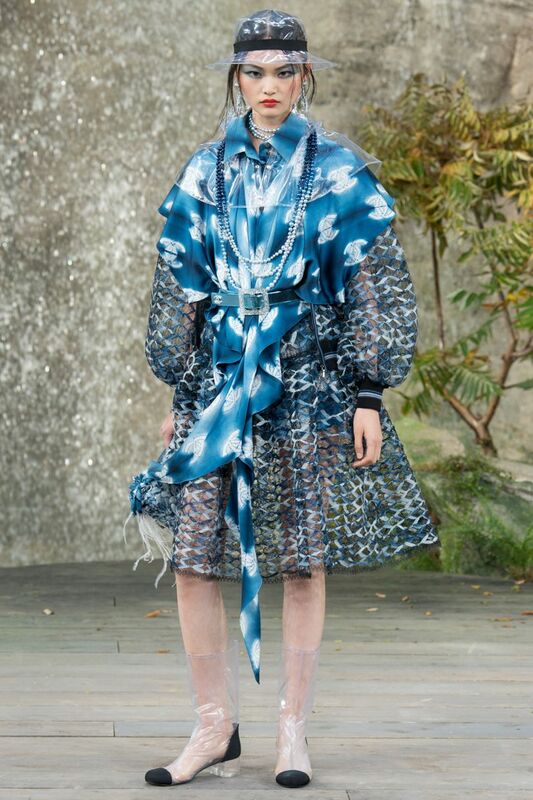 The show took place in a peaceful setting and the models dazzled along the runway as water cascaded down from luxuriant rocks in the background. The atmosphere was subtle and there was nothing distracting the viewer from the clothes, simple yet elegant and opulent. Everything seemed to come together with the utmost perfection from the fresh-out-of-water look of the models to the rainbows formed by the waterfall in the background. 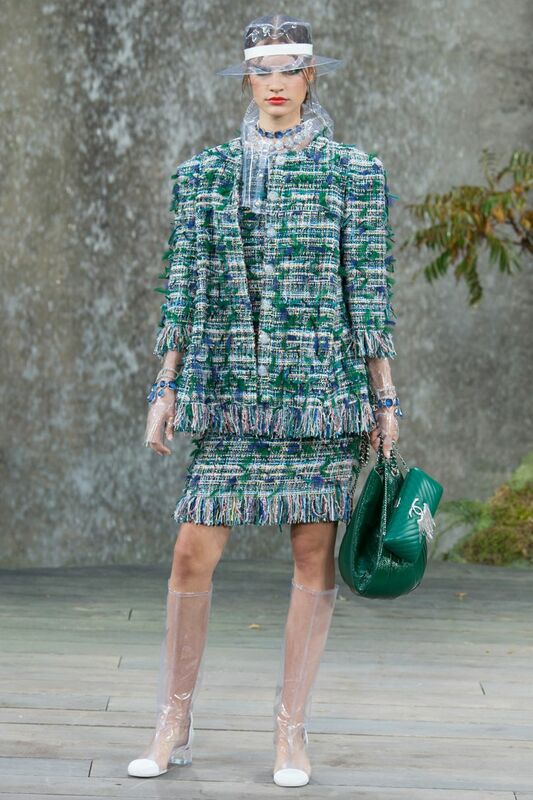 The garments were refreshing in their colors and kept a traditional element with the characteristic Chanel tweeds and a few pastel tones. This mix of tradition and innovation, the young and the old could be seen throughout the collection through the mix of tweeds and PVC. 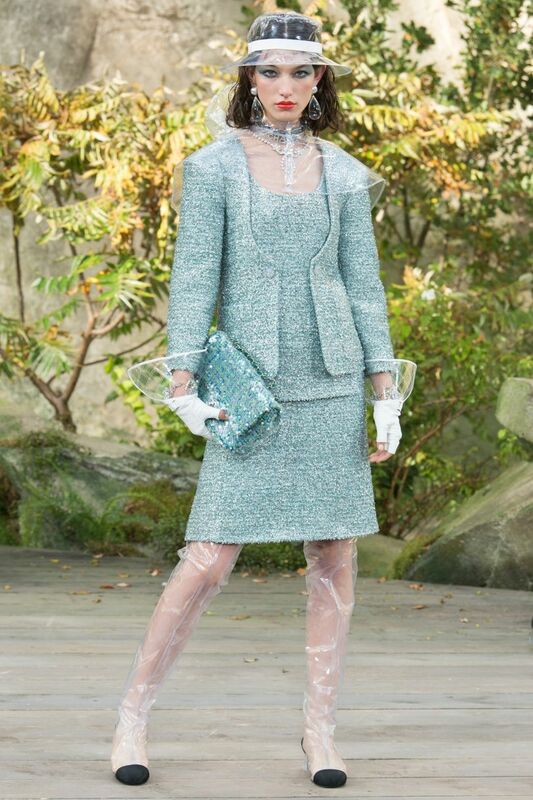 This theme was also seen in some of the garments, which were made of Voile with tweed prints .The models looked as if they had just walked out of water and the clear PVC rain coats, capes, gloves, shoes and hats looked as if they were made of the crystal clear liquid that fell on the background. ​The futuristic air floating in the Chanel runway brought us back to the 60's. The colors, the use of PVC plastic and even some of the silhouettes did nothing to take us away from that. This was enhanced by the deconstructed shapes of some of the garments. Dreamlike: a term often used to describe Chanel collections cannot be left out this time. The collection had a poetic structure to it, a flowing architecture that was beautifully achieved with the perfect mix of organic and structured elements keeping things flowing like water but still keeping an element of solidity. Boots and gloves made out of PVC emphasized the feeling of wetness evoked by the models' hairstyle and make-up and a few sparkly items here and there made us think of the shimmering light that reflects from water drops as sun light shines upon it. Although the colors and the sparkles were rather subtle, in my opinion everything was still very bold and the collection evolved drastically from color to color (there was always an alternation between light and dark colors) as well as with the fabrics and silhouettes used seen by the progression from the tweed to the voile to what to me looked like a double knit mesh and so forth. I was not disappointed by the Chanel show and I doubt I ever will. ​Here are a few curated looks from the collection. Let me know your opinion on the comments below, and if you have watched the show give us your thoughts, we'd love to hear it.